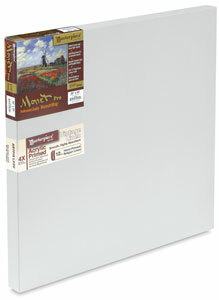 Canvas for acrylic painting comes in a range of forms, from expensive stretched linen canvas to cheap canvas pads. 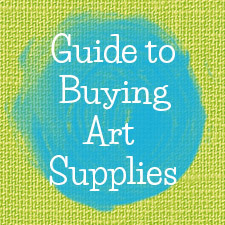 In this article I'll tell you about the different types of canvas supports available for use with acrylics, so you can make an informed choice when you're ready to buy. 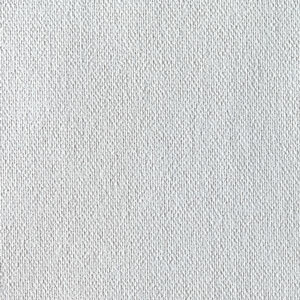 The versatility of acrylics means that you can choose from a wide range of painting surfaces (such as wood and paper), but canvas is the most popular. 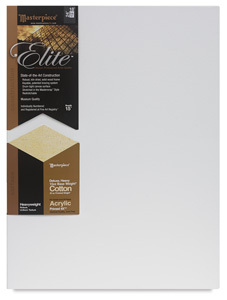 For more info on some of the other options, check out my Other Painting Surfaces for Acrylics page. "Support" is just an art term for any surface on which you apply paint or any kind of medium. Canvas is a traditional support for painting, used for centuries by the masters, and it has endured in modern times as the support of choice. There are 2 main reasons why artists love to paint on canvas: its pleasing receptivity to the brush and its longevity. If you want to create a permanent artwork that will endure for centuries, you can't do any better. Hardwood panels have also been used traditionally to create permanent art, but canvas is much lighter and easier to transport. 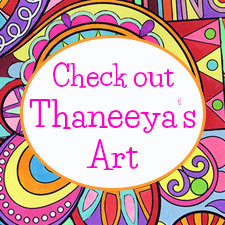 Canvas is also your best option if you want to create a very large painting. The downside, of course, is that canvas can be very expensive. I hope to provide you with a clear overview so that you can select a canvas support that is good for your art and gentle on your pocket. 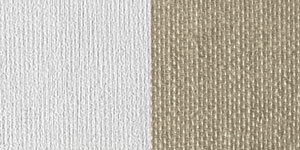 Canvas is generally made from either linen or cotton, natural fibers that are woven together and then stretched over a frame or glued to a panel. Each fiber comes in different textures or weights. 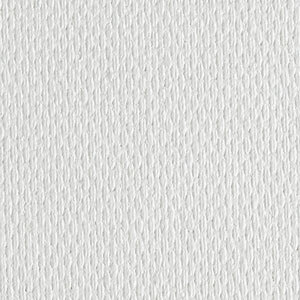 The texture depends on the weave, so a finely woven canvas is smooth and best suited to small, detailed works. A rough texture is preferred by painters who like bold brushstrokes and larger paintings. The weight is dependent on the thread density and is measured in ounces per yard. The higher the weight, the better the quality. Try to avoid canvases with weights lower than 8-10 oz. 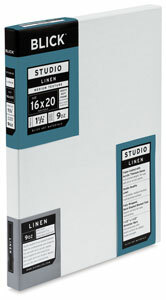 Linen is the best of the best and expensive. If you care about permanence and don't mind paying for it, there is no better option. You can save some money by using a high quality cotton duck canvas, which should weigh between 12-15 oz. 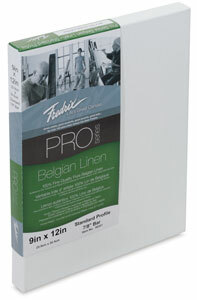 It's cheaper than linen but is still a suitable choice for permanent paintings. Now, lets take a look at the four main ways you can use canvas as a painting surface: Stretched Canvas, Canvas Rolls, Canvas Panels, and Canvas Pads. 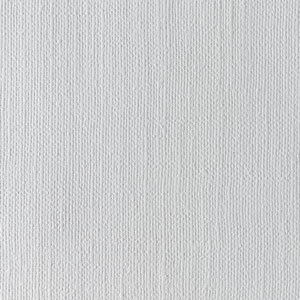 Unless you're particularly interested in stretching and priming your own canvas, I recommend that beginners choose the ready-made kind. 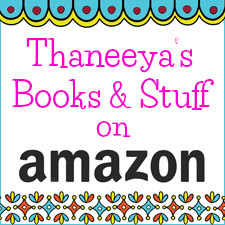 I find it convenient (more time for painting) and depending on the quality I need, quite affordable. 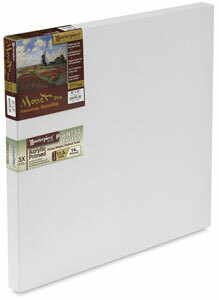 Just remember to look for canvases primed for acrylics and not oils (some are primed for both). 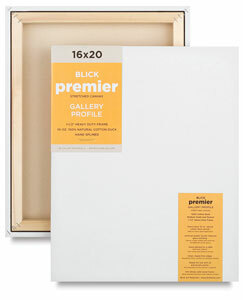 Ready-made canvases can be purchased in different thicknesses, usually referred to as deep or traditional. 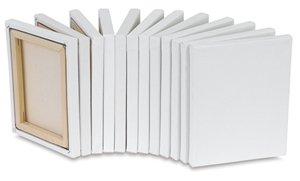 Deep canvases (see photo on the left) have thick stretcher bars, while traditional canvases have thinner stretcher bars. 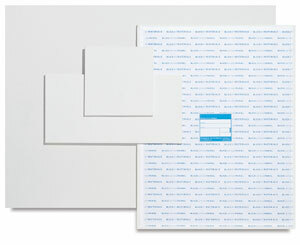 The main consideration here is how you (or your customer) want your canvas to look on the wall. 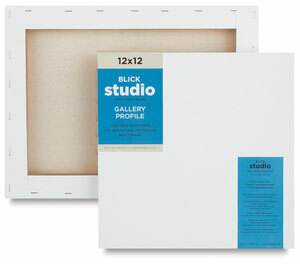 If you want to frame it you should get a traditional (thinner) canvas. For an unframed painting you can go either way, depending on how far you want the artwork to protrude from the wall. With deep canvases you can create a cool effect by painting the sides and edges. If you want to save some money or just like preparing your art materials from scratch, you can try stretching your own canvas. I've never done it myself, but with some simple tools anyone can learn to do it. Some artists stretch their own canvas if they're creating an unusual shape that isn't commercially available or if they're creating a huge painting. 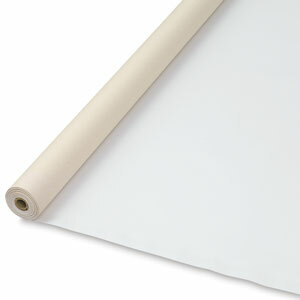 You can buy primed or unprimed canvas by the roll or yard, in a variety of weights, textures and fibers. They are most commonly made from either cotton or linen. Whatever type you buy, whole rolls can be expensive, so make sure that you'll be able to use it all. You don't just have to use canvas rolls for stretching. Some artists, like Jackson Pollock, prefer to lay the canvas flat on the ground and just start painting! You'll want to do some more research before investing in a canvas roll. 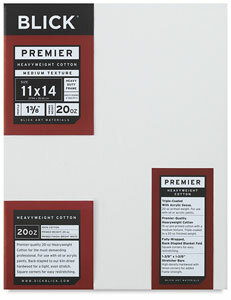 Here are some examples of what's available from reputable brands, for both cotton and linen, at a range of price points. 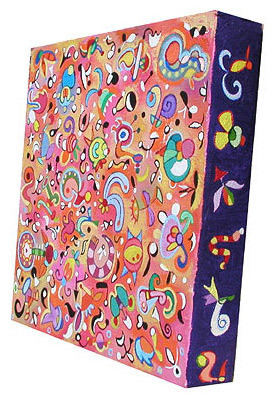 If you're a beginner and can't afford stretched canvas for acrylic painting you can try canvas panels, which are made by mounting acrylic-primed cotton canvas onto a rigid board. 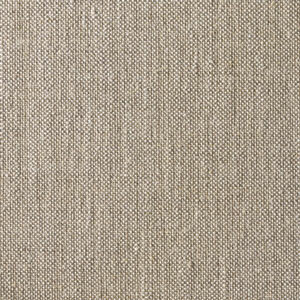 There are even cheaper versions using fabrics like hessian, muslin, calico and scrim. 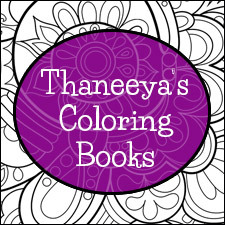 They're cheap, compact, lightweight (great for outdoors) and available in a range of textures and colors. The downside is that canvas panels are not permanent and will degrade over time, so they should only be used for practice. 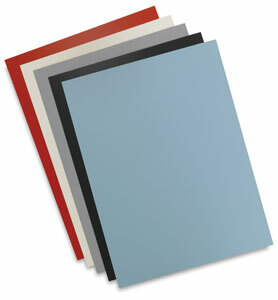 Canvas panels are quite popular with students. 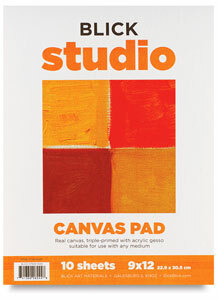 Canvas pads contain sheets of spiral-bound primed canvas or canvas paper that are great for beginners or for practicing. 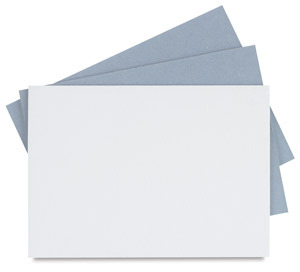 Some pads will contain canvas paper which is simply heavy paper with a surface texture like canvas. 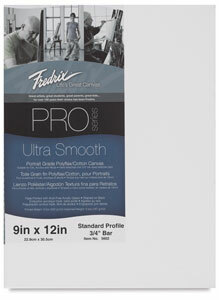 Other pads contain real canvas sheets that can be stretched or mounted. 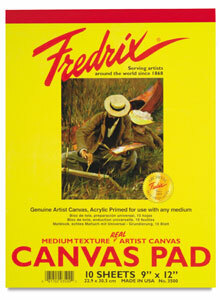 The real canvas pads might last years, but not centuries - so if permanence is important to you, they're best avoided. 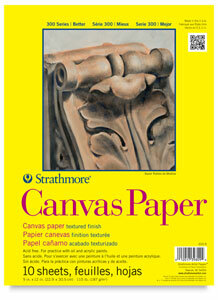 Otherwise, canvas pads are an inexpensive alternative if you want to practice on canvas.